Beverly has been gone for a number of years now, but her legacy lives on. Her name is much less familiar than her friend Elizabeth Zimmermann’s, but they shared a curious and inventive turn of mind when it came to knitting. 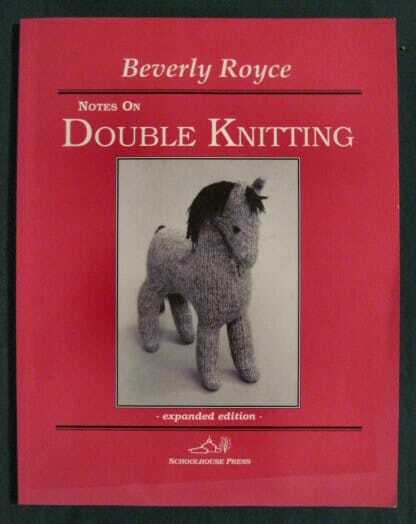 Beverly’s one book, “Notes on Double Knitting“, is out of print and hard to find, but you will see it listed in the bibliography of many knitting books, including “Double Knitting: reversible two-color designs” by M’Lou Baber, published in 2008 by Schoolhouse Press. Out of print and very desirable! Published by Schoolhouse Press. Beverly Royce’s contribution was in experimenting with and documenting a technique for knitting a tube on two needles; she unvented the process while teaching herself to knit, and persisted in it after many well-meaning attempts by others to ‘correct’ her way of doing things. Knitting the fingers of gloves as a flat tube is a logical use for the technique she called “double knitting”, but Beverly went far beyond mere logic! She knit glove liners for mittens, stranded colorwork in double layers, and even two socks at a time, one inside the other – all on two straight needles. Perhaps her best-known creation was the beautiful stuffed pony which graces the cover of her book. This spring, during a spinning demonstration at a small town in the area the Royces lived, I tossed out the question of whether anyone had known her, and whether her husband was still living. To make a long story short, the answer was a resounding “Yes”, and I met a new friend who was willing to facilitate a meeting with Clair. That meeting finally happened on Sept. 10th. Skip Vasey and I met for lunch and then drove out to the house, just outside Langdon, Kansas. Clair is a pretty spry 95 years old, with a mischievous sense of humor. (He wondered out loud, with a twinkle in his eye, about the wisdom of giving him a knife for his birthday as he slit open an envelope.) While he does have some memory lapses, we nevertheless enjoyed a rambling three-way conversation for well over an hour. He was knowledgeable about the spinning wheels still in the room, and reminisced a bit about driving Beverly to EZ’s knitting camp, chaufferring Paula Simmons around – they apparently hit it off immediately – and about Meg Swansen’s continuing friendship. He verified the story in “No Idle Hands” about Beverly’s brother, a World War II POW in Germany, teaching fellow prisoners to knit socks on straightened pieces of barbed wire. Clair was a pilot, and among other adventures, flew a B-36 from England over the North Pole to Nebraska. However, he was never tempted to pick up knitting needles himself, neither during the war nor after! 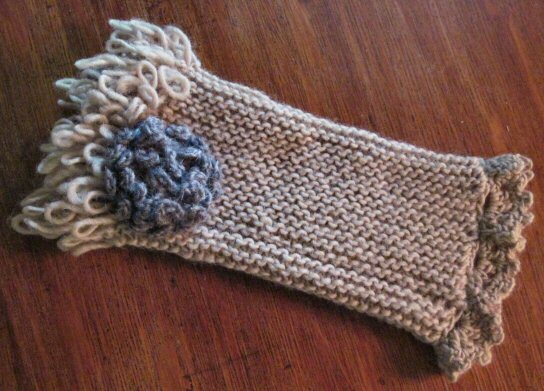 Then he took us into another room (“This house is even older than I am, you know”), rummaged around a bit in a drawer, and pulled out a bag with a few knitted items. 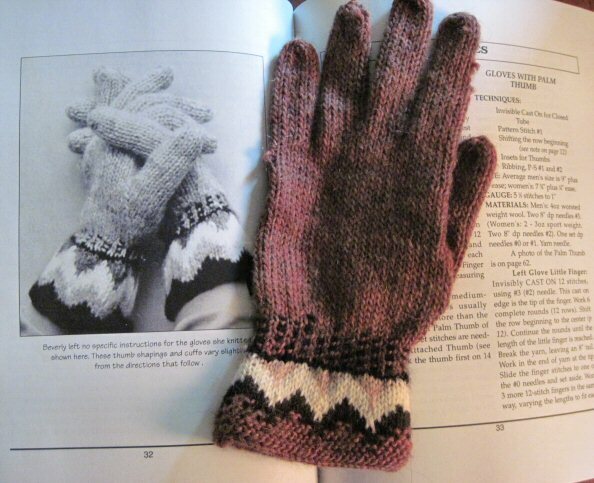 I was astounded to see the gorgeous mittens featured in the book! As Clair and Skip talked about some quilts, I happily photographed the mittens, along with a single glove knit from the pattern in the book, an Angora-edged hat, and an embellished garter stitch fingerless glove. They were all made from Beverly’s beautiful, beautiful handspun yarns. He commented that the famous pony had, unfortunately, strayed away. 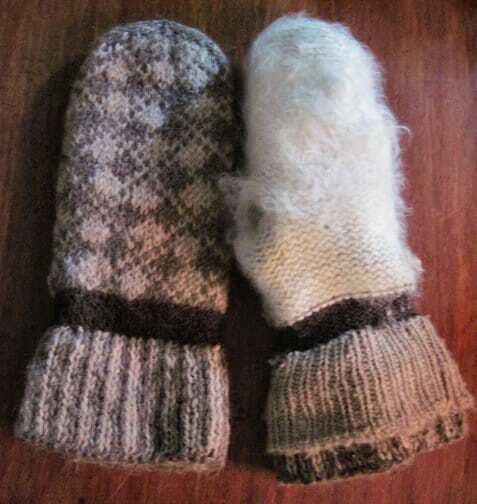 "Two shades of brown Llama top were used for the outer mitten and gauntlet, and a very dark brown for the wrist band... Angora and fine wool fleece, blended half and half by weight... was used as the lining. A 50.50 blend of cashmere and fine wool was spun... for the inner lining and ribbed cuff." 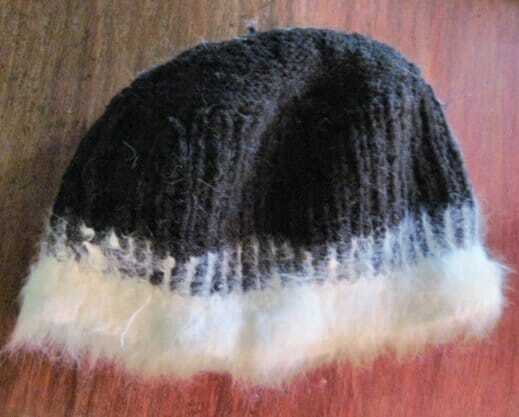 "Spin-Off Mittens" as described by Beverly on p. 62. 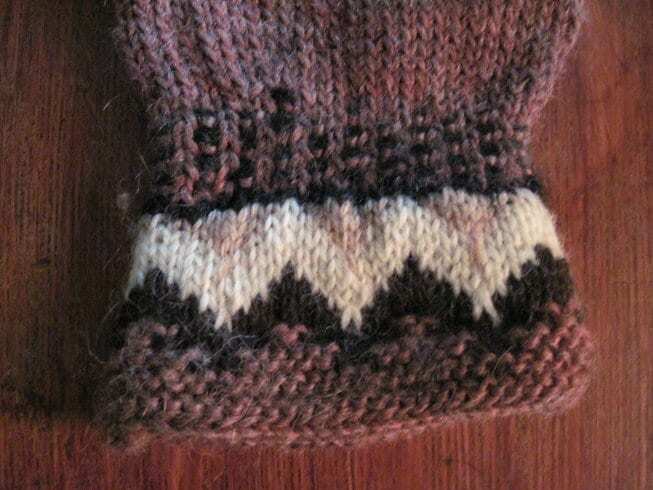 Turned inside out, you can see the angora/wool blend of the inner mitten, and detail of the inner cuff. The dark brown band is a single layer which holds it all together. 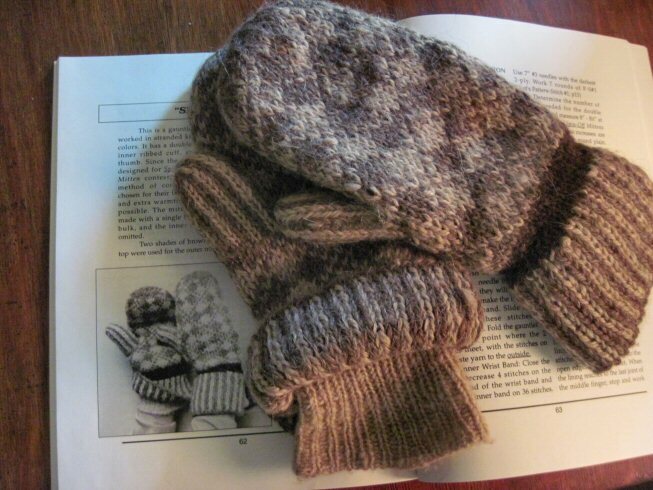 Not the same gloves pictured in the book, but knit from the same pattern. Clair appreciated the good wishes from old friends, and was delighted to know that Beverly’s influence still lives, inspiring knitters to use their ingenuity and her techniques to create lovely things. He apparently likes new friends, too, because before we left, he told me I was a “keeper”, and invited me to come back. I was charmed. I think HE is a keeper! I had an hour or so to muse about our visit as I drove to my next destination on the way home. Our local guild was having a huge sale of donated items, and I had a couple of boxes of yarn to deliver. By the time I got there, the room was filled with fiber, yarn, tools, and books. Since I would not be in town the next day when the sale opened, I got preview privileges. 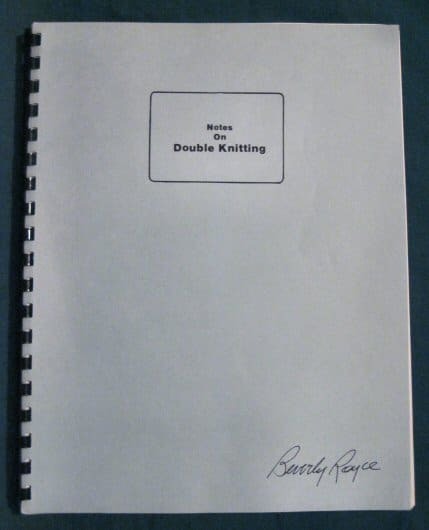 I ended up with a modest amount of fiber and a significant number of books – but the most amazing find was an early self-published copy of <drum roll please> “Notes on Double Knitting” by Beverly Royce! An early self-published version of the book, dated 1981. 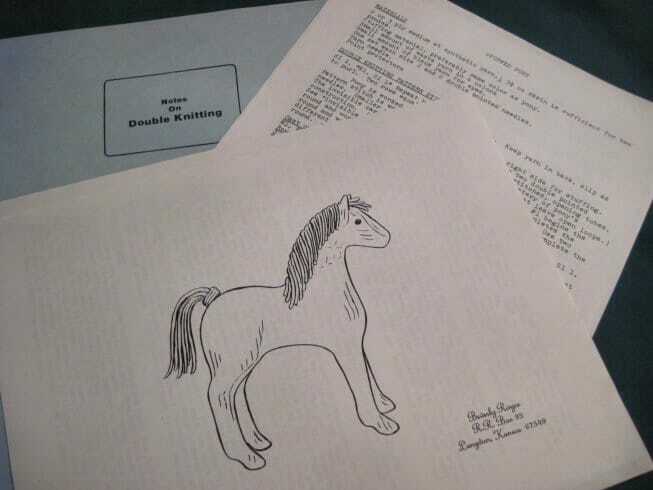 Loose pages inserted in the book - the pattern for the pony, along with some knitting tips. Simply amazing. I cannot even speculate on the odds against this copy coming into my hands, especially on this particular day. It was meant to be. I am sooo happy for you, boyh for your visit to Claire & your wonderful find. now has ownership of Beverly’ notes. I think He would be especially pleased! I knew Bev & Clare, met them in 1981 at EZ Knitting Camp, they camped at the lake, my DH & DD camped there too while I stayed in the dorm. I went to the 2nd Spinoff retreat with Bev, I flew to KS, Bev drove to Co, after the retreat we went to OK, Bev was a treat to know. I have the Notes on Double Knitting that you found , mine Bev gifted me. Next time you see Clare please tell him Sue & Bob in NY were asking for him. Oh, that sounds like good times, Sue! I will definitely pass along your message! I have been trying to contact Clair – to no avail. Do you have his current address and/or phone number? I was wondering if anyone remembered Beverly. I met her at one of Elizabeth’s knitting camps. We became friends and she gave me an autographed copy of her self published books. If I remember correctly this was when she was first introducing her method in the book. Now I have two of the books as my mother bought one also. Hers is marked up as she tried to learn the technique but mine is just as she gave it to me. I often use the technique when working items that are too small for circular needles.